I welcome Saturday - a day I get to spend time with my two working daughters. We discuss children and maids, go out shopping, eat and unwind. Yesterday, we went to Gandhi Market in King's Circle - a market set up soon after India's independence to rehabilitate refugees from Sind and Punjab. There are about 200 shops in the market. Initially it was just a cloth market catering to the lower middle class, but today the market offers everything - vegetables, leather goods, artificial jewellery, decorative hair clips and many other household items. It's definitely a woman-centered market! Though the market is housed inside a single-storied concrete structure, the real fun and excitement begins long before you reach the gate. 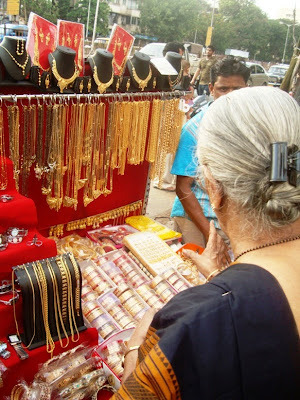 The entire footpath surrounding the market is a shopper's paradise. Small sellers selling readymade garments for kids, innerwear for ladies, napkins, towels, imitation jewellery, churidar sets, etc. line up on either side. Pushing through the crowd enjoying the multi-coloured dresses for children is itself a happy experience. It is an open secret that bargaining starts at 50% of the price quoted by seller. In olden times this market catered mainly to the lower middle class. 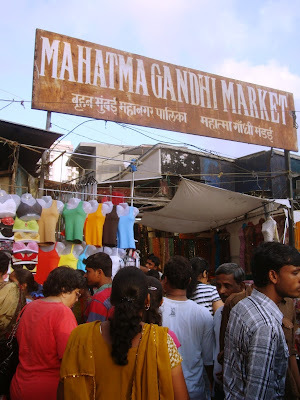 However, today Gandhi Market has grown in size and variety and also offers quality stuff. Very intricately embriodered designer sarees suitable for bridal wear are sold. 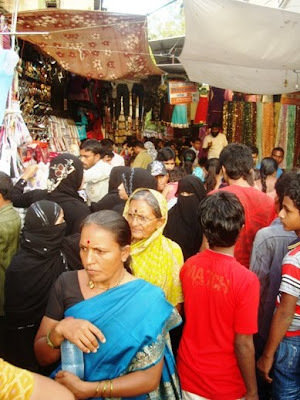 However, the majority of people enjoy an evening buying stuff from the small stalls outside the market, at throwaway prices. 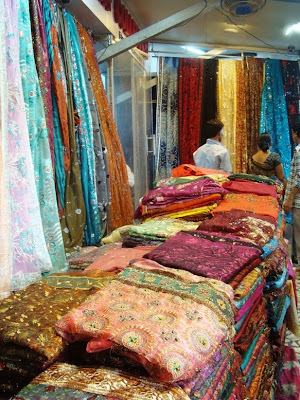 As we approached the gate, I stopped near a pavement shop selling colourful embroidered salwar suits. Just when my daughter tried to click a photo, the owner, a young man of thirty, came and stood near me saying, "Maji ke saath mera bhi photo nikalo" (Please click my photo along with your mother!). He touched my feet for blessings. We all smiled and for a moment he felt like one of us. 'That is Mumbai' I thought. There is a free spirit where all are equal irrespective of one's station in life. 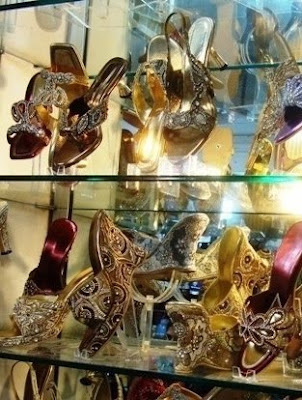 We stepped into a shop selling sandals at fixed rates. I just sat on a stool watching people going in and out. A young lady (she appeared to be educated and modern with short hair and a trendy look) came in and picked up a black and white sandal, tried it and put it back. The shop owner (who was also the salesman) gave her three more sandals, of different patterns, colours and price. She tried all three and quietly walked away without buying - probably satisfied with the very act of wearing them for a short while at no cost! The shopkeeper, cool and calm, unmindful of his wasted labour, turned his attention to his next customer. She was a saree-clad woman, very different from the first one, and looked like someone from a lower income group. But within a couple of seconds, she made her choice, bought an expensive shoe, and walked off. As every good salesman knows, it's all a matter of chance, and even people who step in casually may go home with a bagful of purchases. 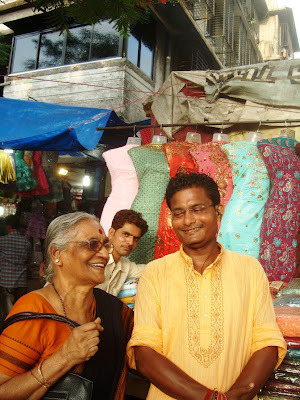 The Mumbai salesman's patience is legendary (especially in saree shops!). 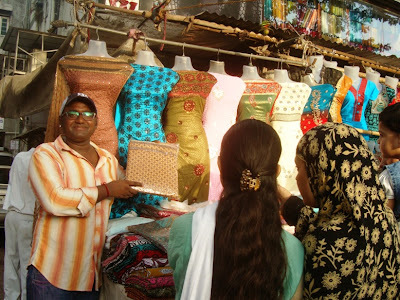 In the major saree markets, you will find salesmen always encouraging you to see more and more of their goods. "Dekhne ka paisa to nahin lagta behen", they say with a smile. "Costs no money to see". 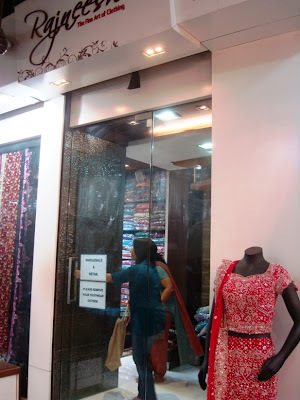 They will do their best to present all their goods, tempting you with one offer after another, until you find that one saree you absolutely cannot resist! 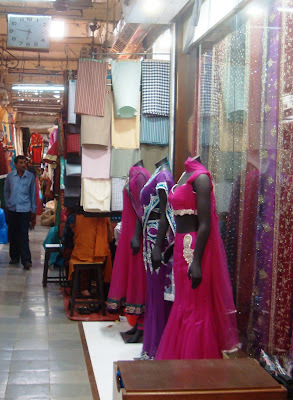 Mumbai is a shopper's haven, yes, but is also the the marketing capital of India. I'm quite sure no other city in India can match the sales and service levels that Mumbai shops offer. 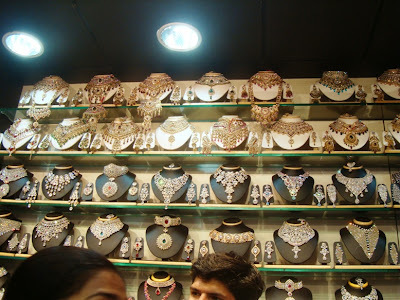 Finally we came to the jewellery section. Glittering stones of all hues set in traditional as well as modern designs, to match every outfit and every occasion, were displayed with the board 'SALE 50% REDUCTION'. We were almost tempted to buy some ear-rings, but we were running out of time, so we returned home. We had spent nearly two hours in and around Gandhi Market, and the faces of smiling, hardworking sellers continued to linger in my mind.